Today's Daily Vintage is this charming Victorian trade card featuring a woman - perhaps a circus performer - balancing on a giant bubble. This card is TINY (2.5" x .075"). I purchased it at an ephemera show, and was told that it dates 1870's to 1880's. I think it would look great in a small frame. I have framed small pictures like this with vintage paper or vintage-look paper (from your favorite craft supply or art supply store) as a background. 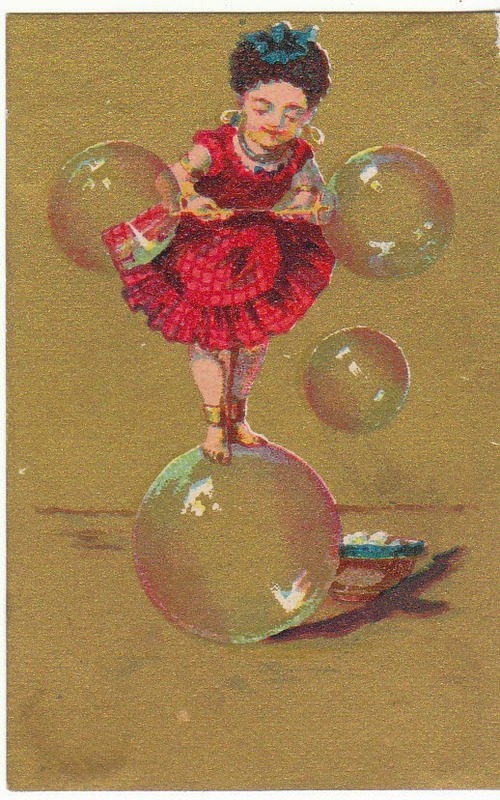 This Victorian card is at Birdhouse Books: Victorian Trade Card, Woman Balancing on Bubbles. Love this card, Trish. It reminds me of a circus performer so I'll pin your post to my Circus board.